The MagPi issue 36 is here and we’re in print! It’s with an almost rude amount of excitement I can announce that issue 36 of the Official Raspberry Pi Magazine, The MagPi, is here! It’s bigger and – dare I say it – better than ever too, with 100 pages of amazing projects, interviews, features, tutorials and reviews. Click the pic to buy the print edition from the Swag Store today & have it delivered to your door. It’s not just here in the virtual – download your free PDF edition today – sense, though. It’s also here in the physical – take me to the smallest room of the house – sense too. As of today UK readers can pop to a local branch of WHSmith or a newsagents to buy the magazine RIGHT NOW for £5.99. US readers will be able to pick it up from Barnes & Noble or Micro Center in two short weeks (or just grab a copy from the Swag Store). 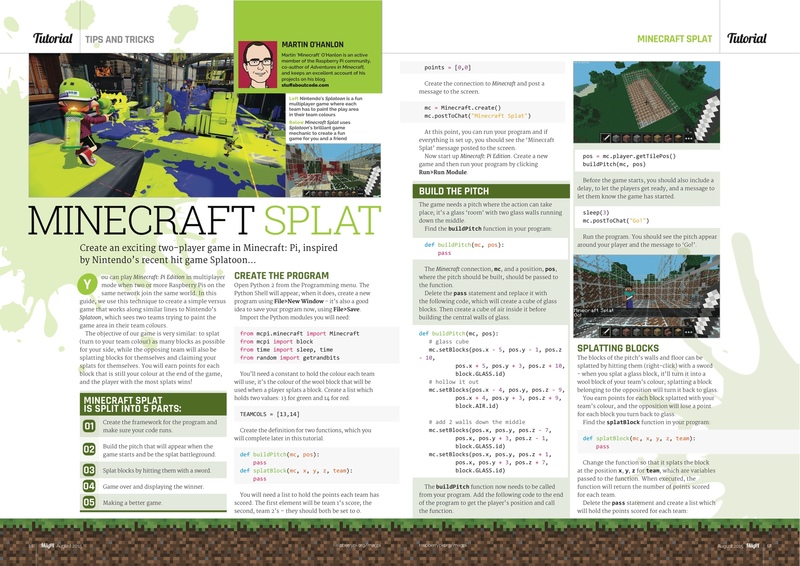 One of my favourite articles from #36 is Minecraft Splat, which is a multiplayer Raspberry Pi-remake of Nintendo’s modern classic, Splatoon, made in Minecraft Pi. Martin ‘Minecraft‘ O’Hanlon (of stuffaboutcode.com fame) kindly agreed to give it a shot for us and he delivered in spades. 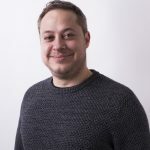 If you enjoy that, you’re sure to love Adventures in Minecraft, which he co-wrote with The MagPi’s Technical Editor David Whale. Minecraft Splat makes for some great multiplayer mayhem! If you’d like to subscribe to the print magazine it’s really rather easy. All you need to do is call +44(0)1202 586848 or visit The MagPi Subscriptions site. You can save up to 25% on the cover price and have it delivered to your door before it even hits store shelves. If you order while the first issue is still on sale, you’ll get issue 36 sent out straight away. Also, if you’re a teacher, after school club leader, part of an educational scheme or simply want to horde as many issues as possible (we don’t mind), you’re entitled to a massive discounts on multiple copies. Please let us know and we’ll be happy to help. Finally, it’s very important for me to stress that The MagPi is a Creative Commons publication. This means it’s free to download and share in PDF format. Why bother buying it at all? 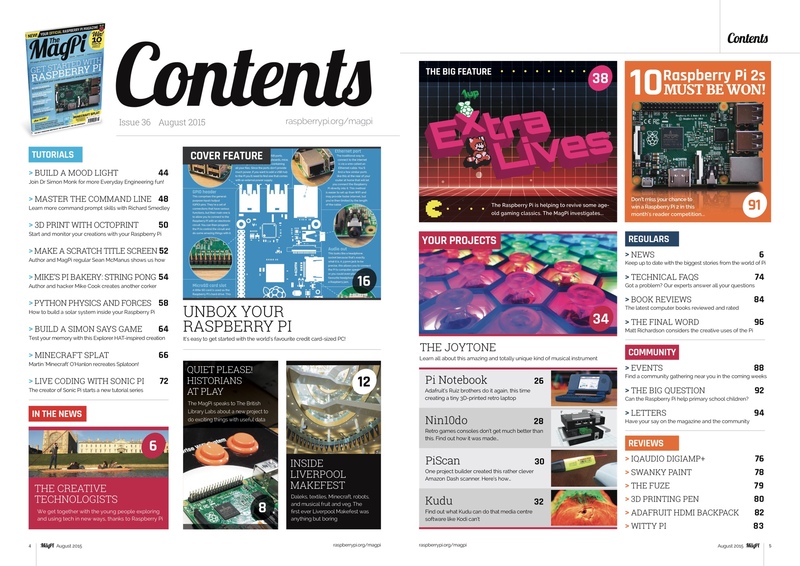 Well, like the Raspberry Pi itself, all the proceeds of The MagPi magazine are channelled back into the Raspberry Pi Foundation, a UK charity dedicated to making affordable, programmable computers available to everyone, all over the world. We think it’s important that children and adults from all walks of life have access to the internet and applications, and have the opportunity to learn to code if they want to. We hope you feel the same way. The Raspberry Pi makes all of this possible and I very much hope The MagPi Magazine helps make it fun. I’ve been looking forward to seeing the MagPi in print in shops for ages. It’s so exciting that it’s finally here! Very exciting. Thank you for your kind words, it was great fun. Another big giant leap! The Official Magazine on the shelves =o) Well done to all the contributors (& of course to Russell at the helm). More public visibility for the Pi! Really pleased with all the contributions in this issue – thanks for the kind words. Exciting plans ahead that will hopefully blow your collective socks off. You win a special prize! It’s a big /facepalm on my head. Watch out for a special feature looking at Pi Wars in the next issue. So far for PiWars 2015 I have some white board scribblings, a plank of wood, and a set of wooden skittles (Which I was playing with last night)…. I should really get around to some actual robot building! SO excited about this – at the moment I’m in the US at some meetings, but the very first thing I’m going to do when I get back at the weekend is to visit the airport WHSmith! Massive thanks and congratulations to Russell, all the writers, and to the editorial team. We’d love to be able to do sell same-day in America, but it’s not practical. The US issues are currently being shipped to the states – they’ll be on sale between 2 and 3 weeks after the UK on sale date at Barnes & Noble and MicroCenter. Can’t wait for them to get there! A lot of mags were grey imports which was why they were there so early. Ssh! I was going to blog about it next week! Just plain brilliant. Very well done Russell, Eben, Liz and all involved. 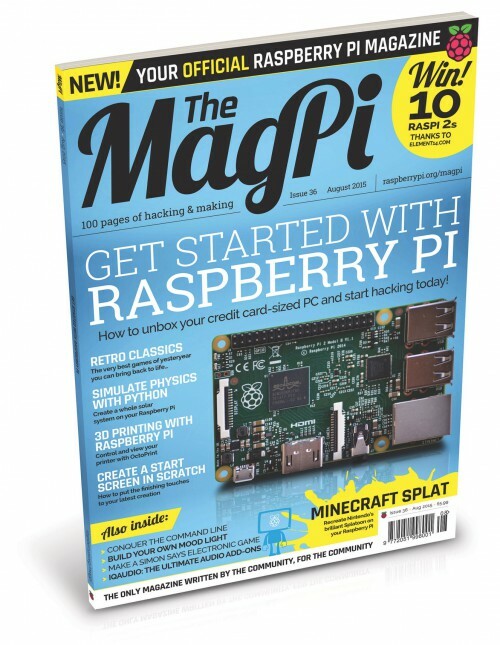 Very pleased and proud to finally see The MagPi in the High St.
Any plans to make a subscription available in the US? I can’t think of anything more awesome than getting home and finding a brand new crisp edition of the MagPi waiting for me every month. Great quality print version. Mine was hand delivered by the postie today. Well worth taking out a subscription. The students at my secondary school have loved learning to code in Minecraft this year. What a brilliant idea for my after=school coding club to code a splat game :-) Thanks for sharing this with the community via the magazine. After a bit of a hunt in the local WHSmiths (thanks to help from the staff!) managed to snag a paper copy! Found some copies at my local WHS, partially hidden behind a stack of Macazines (why are there so many Mac comics showing how to use a Mac when the thing is supposed to be “intuitive”?). Anyhow, rearranged affairs so The MagPi was clearly visible and took a copy to the tills. Its an excellent mag, I’ve read it since issue 1, back in May 2012 – how many Model Bs were in the wild at that date?! * I’ll be getting future printed issues, might even take out a sub!